We call our programs "Adventure Camps", because they are much more While the allure of Adventure Riding is widespread and inspiring, practical application is another matter entirely. Countless new Adventure Riders have ‘stopped’ being adventure riders after a few short attempts at riding dirt. After all; handling a ‘big’ bike on the dirt is a very unique endeavor. Riders with no dirt experience, or those with time only on smaller dirt bikes often find themselves outside their comfort zones when on a ‘big’ Adventure Bike. 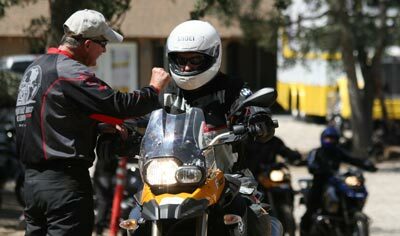 RawHyde Adventures has spent more than 10 years instructing new, intermediate, and advanced riders on the nuances of managing Adventure Motorcycles on off-road terrain. We have helped thousands of people of all ages become confident on these large machines, helping them achieve their goal of becoming accomplished Adventure riders. Join us at RawHyde and bring your riding skills to the next level.